An Israeli court has handed a Palestinian prisoner who has been on hunger strike since August last year an eight-month sentence, of which he has another month left to serve. Samer Issawi’s fate, however, remains unclear, as there is still another case pending against him in an Israeli military court. Issawi, 33, was convicted for violating his parole by the Jerusalem Magistrates Court on Thursday. The court said that he violated the terms of his early release in October 2011 by taking his car to be fixed at a garage in the West Bank, his lawyer Andre Rosenthal told AFP news agency. “He admitted going to the West Bank and he was sentenced to eight months,” he said. Issawi was arrested on July 7 but was only convicted and sentenced on Thursday when he was handed a sentence which expires on March 6. 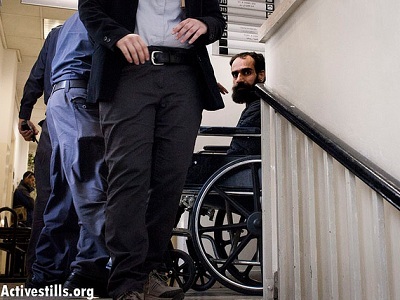 Issawi’s fate will only finally be determined by a second hearing at an Israeli military court on March 21, however. That hearing could see him being sent back to jail for years. Issawi was initially arrested in 2002 and sentenced to 26 years for his military activities on behalf of the Democratic Front for the Liberation of Palestine, but he won early release in October 2011 as part of a deal which saw 1,027 inmates freed. But Issawi, who is from occupied east Jerusalem, was rearrested in July for violating the terms of his release by visiting the West Bank. He has been on hunger strike since August 1 in protest. The military order in question governs the freedom of movement of former detainees, allowing for them to be rearrested if they move outside a certain geographic area close to their home without special permission. It also says they can be rearrested on the basis of secret evidence. The rules also state that if they are deemed to have committed a new offence for which the penalty is three or more months in jail, then a military court can force them to serve out the remainder of their original sentence. Depending on the outcome of the March 21 hearing, Issawi could be forced to serve the remaining 16 years of his original sentence. In another development on Thursday, around 20 Palestinians were wounded when a demonstration of solidarity with hunger-striking prisoners turned into clashes with Israeli troops near the Ofer military prison outside Ramallah, medics said. “Most of them were wounded by rubber bullets or suffered tear gas inhalation,” Talah Aideh, ambulance worker, told AFP. Several hundred people had joined the demonstration in support of four long-term hunger-striking prisoners including Issawi, witnesses and an AFP correspondent said. Many threw rocks and burned tires after Israeli forces stopped them from marching to the prison. The demonstrators, some masked and others draped in green flags, attempted to block a road using large stones, garbage bins and tires set ablaze. The Israeli military said there were an estimated 300 people demonstrating and that security forces used non-lethal means to break up what it called a violent riot. It said two Israeli civilians were injured. The fate of the 4,500 prisoners held by Israel has sparked widespread protests across the Palestinian territories and expressions of concern from the international community. On Tuesday, Ban Ki-moon, UN chief, said he was “deeply concerned” about the hunger strikers, singling out the case of Issawi. Last year, hundreds of Palestinian prisoners went on a mass hunger strike to demand better conditions in jail. In a deal mediated by Egyptian officials, they were promised more family visits and limits on administrative detention. Issawi was among those freed in a 2011 exchange that released hundreds of Palestinians, many of them participants in deadly attacks, in exchange for an Israeli soldier held by Hamas-backed fighters.